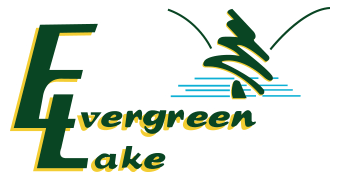 Camping at Evergreen Lake is an experience that will make you feel like you’re hundreds of miles from home! Our campgrounds have 250 wooded shady sites tucked into the base of the Blue Mountain well away from the noise of busy highways. Our tent sites are also located in a fully wooded setting for those who want to get even closer to the great outdoors. Each of our campsites and tent sites have picnic table and fire ring to complete your camping experience along with modern restrooms with hot showers. Other amenities include electric, cable TV hookup, sewer and a gathering area for groups and a white sandy beach for swimming. Every weekend we have a variety of scheduled activities for campers to enjoy including pot luck dinners, scheduled themed dinners, make your own ice cream sundaes, horseshoe tournaments, Christmas in July and flea markets. Laundry facilities are located at both bath houses and FREE Wifi is available in the main office. We have an arcade with video games, pinball machines and pool tables located adjacent to our play area which includes ball field, swing set, sandbox, merry-go-round, basketball and hiking trails. We also have an on site miniature golf course. Camping supplies, ice, LP gas, firewood and snack area can be found in the main office. 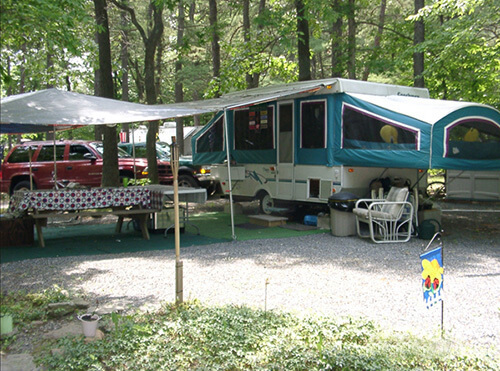 Campsites are available to rent by the day, weekend, weekly, monthly and seasonally. We have on-site security.